Right around lunchtime Saturday, Nebraska lost its center. Michael Decker, a 6-foot-4, 305-pound junior center from Omaha Nebraska, announced on Twitter he will be stepping away from football and leaving the Huskers' team. "Over the past six months, I've taken a step back and looked at my future career goals and decided that I can no longer accommodate football's commitments," Decker wrote. "It was finally time to see that these aspirations outweighed the lacking desire to continue playing the game. Which, given the team's goals, would only hurt them by my participation." Decker's decision to step away from football leaves Nebraska with 14 scholarship offensive linemen and puts Nebraska at 85 scholarships total. He's the fifth member of the team to announce they are leaving; quarterback Patrick O'Brien, fullback Ben Miles and wideout Keyan Williams have all announced decisions to transfer while offensive lineman Bryan Brokop made no announcement but changed his Twitter bio to "former Nebraska football player." Decker appeared in six games last season once beginning-of-the-season starter Cole Conrad went down with injury, starting five in a row before suffering a season-ending injury of his own. He injured his knee against Purdue on October 28, an injury that would require surgery and recovery that stretched into the spring. With Decker in the middle, Nebraska was better. The Huskers saw three of their top four rushing performances of the season and the top two right away against Rutgers and Illinois. Coaches praised the analytical approach and commitment to communication Decker brought to the line. Despite his absence, many expected Decker to regain the job at center if he returned healthy before the start of the season. 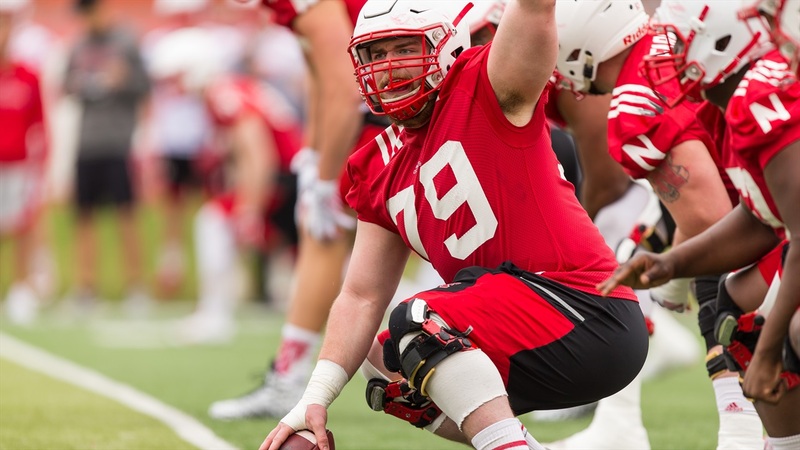 In his place this summer, redshirt freshman Hunter Miller, right guard Tanner Farmer, left guard Jerald Foster and true freshman Will Farniok rotated at center. Miller came on strong to begin the spring, but as practices wore on, Farmer began to play more and more in the middle. If line coach Greg Austin elects to slide Farmer, a multiyear starter, over, it would open up his right guard spot to someone like Farniok or even someone like Boe Wilson. Cole Conrad will also be an interesting name to watch as he has experience both at center and tackle. Nebraska will have options on the line and decisions to make at every spot, but the coaching staff said many times in the spring the best five guys would play regardless of position. Austin spent a good deal of the spring cross-training not just guys at center but all over the line. Nebraska could potentially have one or two more roster spots open up in the coming months; head coach Scott Frost would like to have at the least one free scholarship heading into the season in case someone comes along late. At Central Florida last season, the Knights added cornerback Mike Hughes after they had already begun fall training camp. Hughes was recently selected in the first round of the NFL Draft.